It's summer and time for outdoor parties. 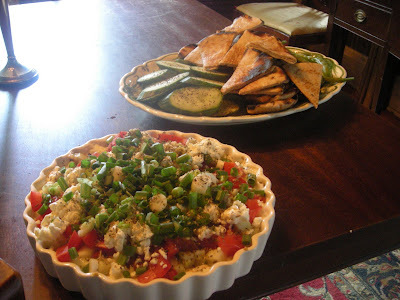 Often, the parties include an appetizer for the communal appetizer table. With summer, we yearn for something light but tasty as well. I found this Greek Dip on line and took it to a "do" last week. I came home with an empty dish and rave reviews. 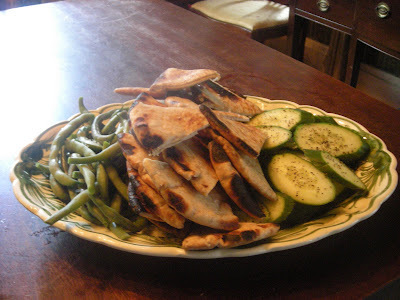 To keep the dip even healthier, I chose slices of zucchini (sprinkled with pepper) and fresh green beans (blanched, shocked and sprinkled with sea salt) as well as whole wheat pita bread (brushed with olive oil and sea salt and warmed over the stove grate). It's an easy recipe and the only adjustments I made to the online recipe was using plain yogurt instead of Greek (alas, the only Greek yogurt on the prairie was vanilla flavored!) and I omitted the olives to please Husband Jim. They would have made the dish even more interesting both in flavor and contrast -- but he doesn't like them! I put my "dippers" on my green and white Greek plate -- thought that was appropriate for my Greek appetizer. Instead of a pie plate I used a quiche dish. Will I make it again -- of course, I will. AND I think you can make a smaller quantity for less guests. 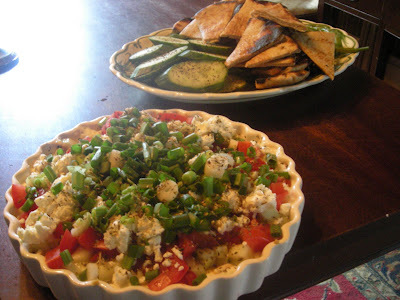 Online it's known as Zorba's Layered Veggie Dip -- at Linderhof, it's known as Greek Yogurt Dip! The recipe as posted -- with my changes noted. Spread the hummus evenly over the yogurt. Sprinkle with cucumber, then with tomatoes, olives, feta and green onions. Sprinkle top with oregano. 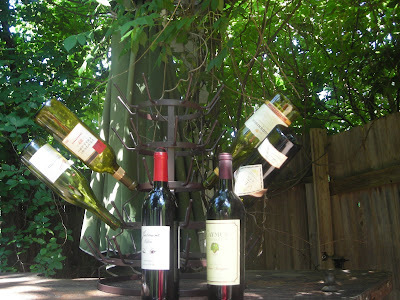 In every French farmhouse wine cellar is the bottle dryer. 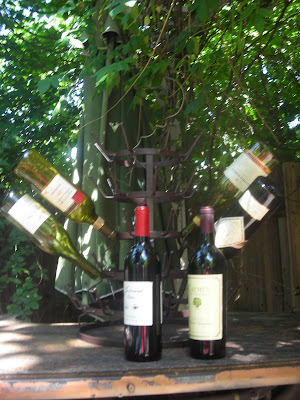 A place, where, when the bottles are empty, they're rinsed and then put on this iron rack to dry. To be refilled, after the next vintage is ready. I've coveted one "forever" -- and passed on a couple thinking that they were too dear. But, alas, they were "buys"! Silly me! But I did find one and paid way too much for it -- but sometimes you just need to get those "always wanteds" -- no matter the price. This was one of those times. 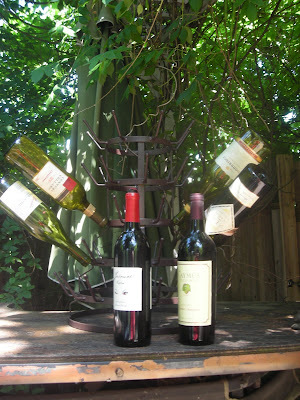 When I think of all the wine bottles we've thrown away in the last few months . . . . sigh . . . but we have managed to empty four! I'm not sure how many bottles this dryer holds -- but it may take us a while to fill it! We currently have it in the garden. I want everyone to see it. 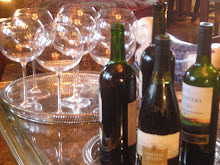 If we put it in the cellar (where I suppose it does belong) -- we'd be the only one to see my treasure! 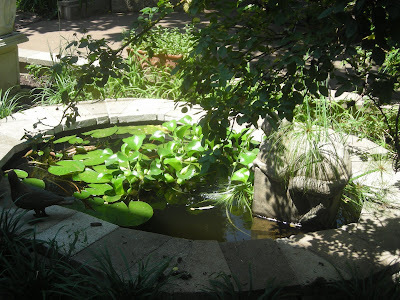 More images from Linderhof's garden -- from last week's garden tour . . . .the heat of this week has certainly taken a toll on some of the plants. 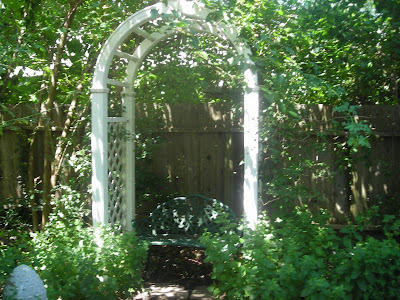 An arbor at the back of the patio -- sweet smelling pink roses climb over each side. 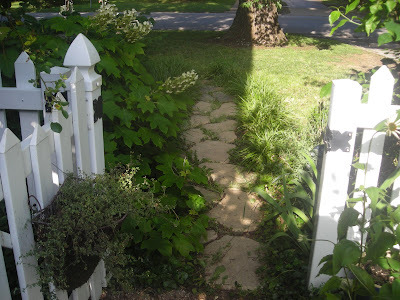 The brick path from the patio to the potting shed -- lemon balm lines the right side in front of the iron fence. 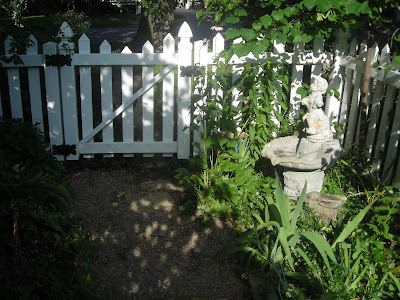 One of the many pieces of concrete in the garden -- this one holds flowers -- pansies in fall, lettuce in spring, and a combination of fern and caladium this summer. 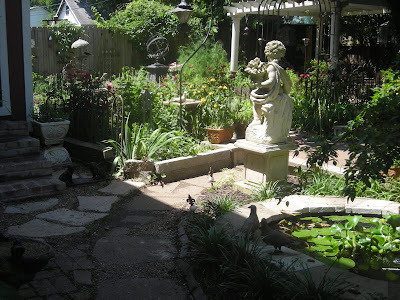 The faerie garden -- the spikey things on the right are called fairy lilies. A lovely pink bloom. 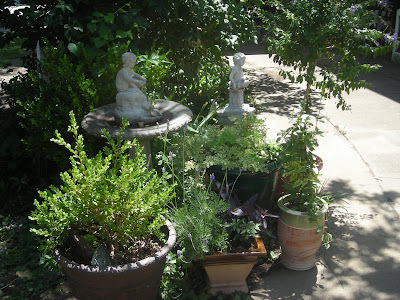 As you walk up our drive -- two old ladders add interest, a "Southern" iron chair and the boxes (which are usually filled with begonias -- but this year some spilly purple plants) -- and just before the garden -- our frog fountain! The pond and the backside of the cat! 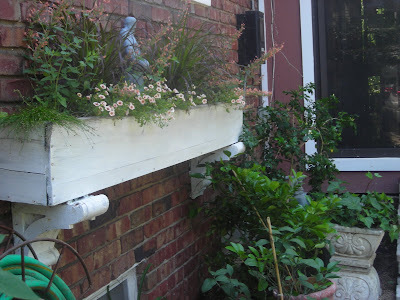 The window box filling out nicely. 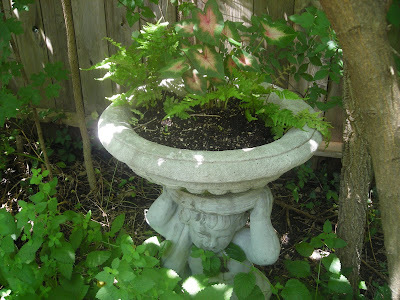 The tulip poplar with favorite pots -- French ones filled with endless summer hydrangea, a great concrete box filled with angel wing begonia and a favorite lion's head pot with pink geraniums. 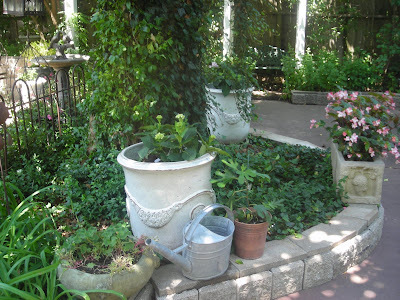 The plant in the clay pot is a fig tree -- tiny -- but perhaps some day Linderhof's gardens will have figs! 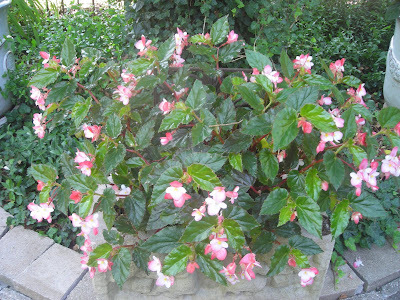 The angel wing begonia -- which will probably have to come in this winter -- it is absolutely stunning! 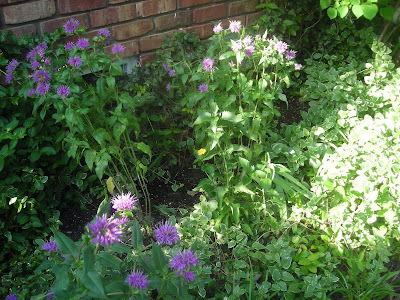 It's always fun to join in Artie's Share a Garden Sunday -- To see more great garden's (including Artie's) -- just head on over to Color Outside the Lines. Garden touring is tiring. And on the prairie it is often hot. So when we were on tour at Linderhof, we baked shortbread cookies for our tour guests and served them in the breakfast room. A place where our tour guests could go to get out of the sun and heat. 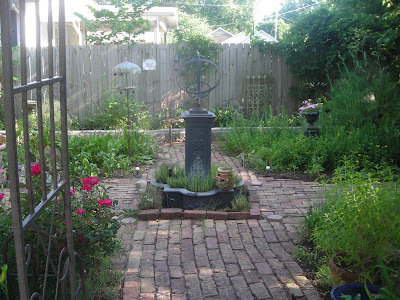 Since our garden is mostly herbal, we did herbal shortbread -- lavender, rosemary and orange, and ginger lemon. A nice selection for our guests. 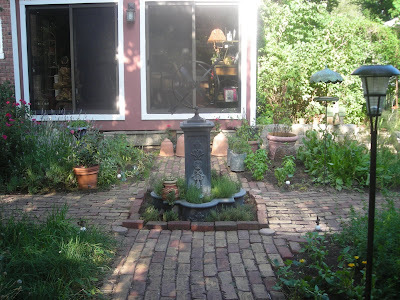 But garden touring is thirsty as well and so we had a jar full of herbal green tea. The jar filled with ice before the tea was poured in, it was a cool drink in a mostly hot day. 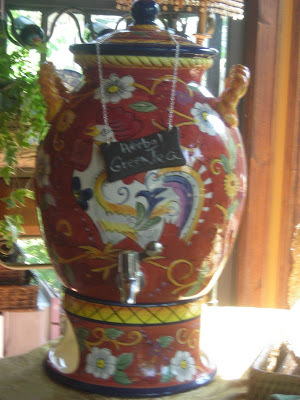 The rooster dispenser was a gift from a dear friend and one which I treasure. The sign was a new acquisition from Sur La Table -- slate so you can change as you change your beverage! 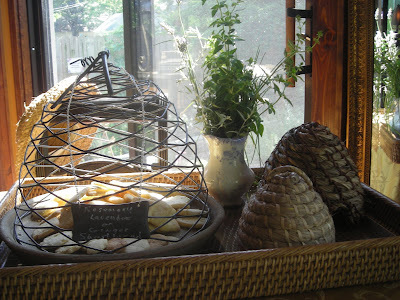 The slate sign worked as well on the bee skep that protected the cookies. 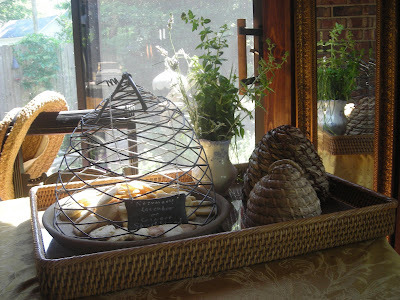 Since it was a garden tour, I thought bee skeps would be a great theme for the cookie table. 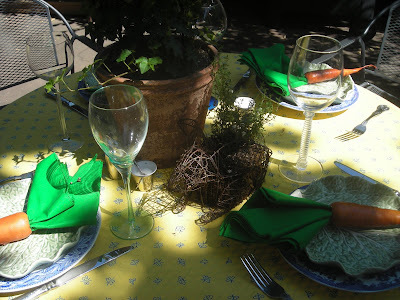 A metal skep under which the cookies were served and two smaller grass ones just to decorate the table. 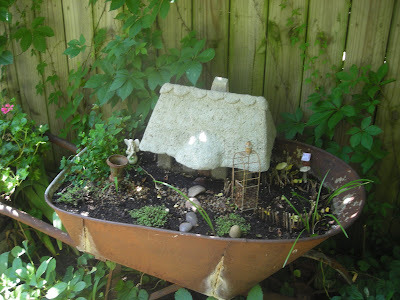 The big skep was from Red Cedar, a favorite garden store of mine. The littlest one was also from there while the bigger one was from a favorite Fort Scott store, Iron Star. The shortbread is my favorite -- plain, with herbs added, with ginger and lemon. It's a great shortbread and so easy to make. 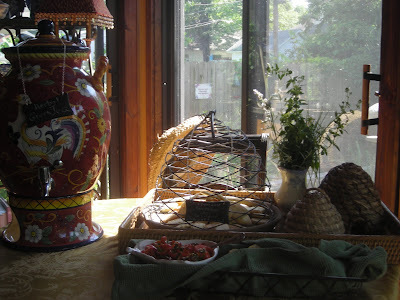 Our guests enjoyed their brief respite -- and I enjoyed sharing my green tea and my herbal cookies. We love German's Chocolate Cake with pecan coconut frosting. A treat for me as a child -- baked only for company Sunday dinners. The German's Chocolate Cake was a 3 layered cake -- not two like the rest of our Sunday cakes. It was definitely a company cake! The best part of German's chocolate cake to my childhood thinking, was licking both the frosting and the cake bowls! We always called it German's -- not German for it is named not for a country but for a man -- a Mr. German. And it was in 1957, when a Dallas housewife submitted a recipe to the newspaper for "German's Chocolate Cake". From then on, the rest is history! But I didn't want to do a cake today and so I took an easier route by making cupcakes. 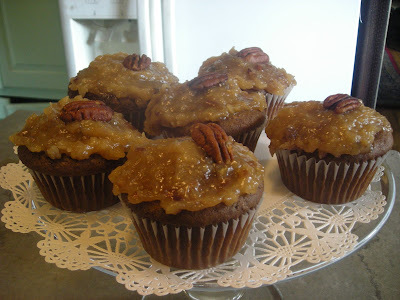 Inspired, perhaps by Ina Garten's German Chocolate cupcakes in the latest issue of House Beautiful. Alas, I didn't use that recipe but the original one from my mother -- perhaps the same recipe that was originally submitted to the Dallas newspaper. Mother was an ardent clipper of newspaper recipes! 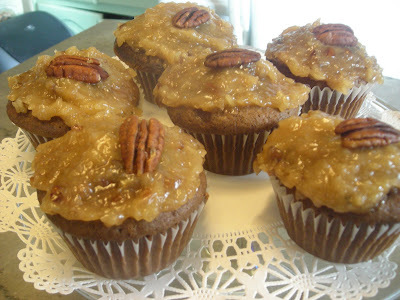 And, of course, you can't have German's Chocolate Cupcakes without the pecan coconut frosting. Like cream cheese frosting is to carrot cake (the cake is only the carrier for the frosting) so perhaps is German's chocolate cake to pecan coconut icing! It's Friday again, and we all love to share our recipes at Designs by Gollum. Click to visit and see what else is cooking this Friday! Grease two 9 inch layer cake pans and line bottoms with waxed paper. Sift together flour, sugar, baking soda, baking powder and salt. Cream butter and sugar; add flour mixture, 3/4 c. buttermilk and vanilla. Stir until dry ingredients are moistened; beat at medium speed of electric mixer for 2 minutes, scraping bowl from time to time. Add melted chocolate, eggs, and remaining 1/4 c. buttermilk. Beat 1 minute longer. Pour batter into prepared cake pans. Bake in a preheated 350 oven for about 35 minutes, or until a wooden pick inserted in the center comes out clean. Cool in pans on rack for 15 minutes. Remove and cool completely on racks. Frost with pecan coconut frosting. In a saucepan over medium heat, combine milk, sugars, butter and vanilla. Bring to a full boil, stirring constantly. Remove from heat (mixture might appear a bit curdled). Quickly stir a small amount of the hot liquid into the beaten egg yolks; return egg yolk mixture to the hot mixture in saucepan and blend well. Return to a boil, stirring constantly. Remove from heat and stir in coconut and pecans. Cool to spreading consistency, beating occasionally. 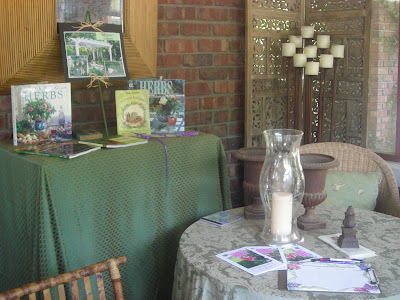 Part of the Garden Tour was setting up the two patio tables as if we were entertaining. Of course, there was no food . . . for it was only for show. 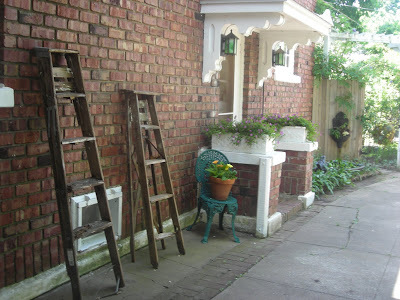 But we felt that we needed to create a Garden Party atmosphere for our patio. 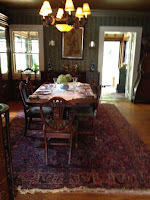 Each table was set for 4 -- and although not totally identical they were similar. Each table had a Guy Wolff pot planted with a topiary -- this one was ivy. And matching Williams Sonoma tablecloths. The pail and watering can salt and peppers -- two for each table. Another idea copied from Bunny Williams. (These came from Smith and Hawken) I use them both inside and out. As indoor plates are blue and white so our our outdoor ones. These are Johnson Brothers Asiatic Pheasant. 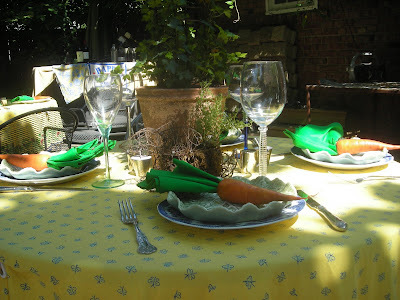 A cabbage plate atop the blue and white one and a green napkin tucked into a carrot -- as a sort of whimsy! 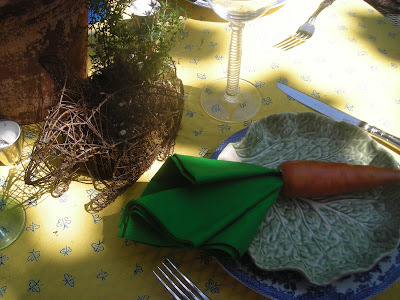 Because there was a bunny on each table -- this table had my thyme bunny topiary! 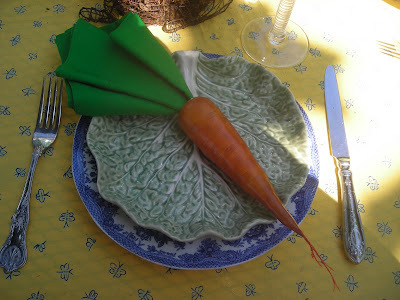 I had fun decorating the tables for the tour and the carrot napkin holders generated a lot of attention. I said there was only imaginary food -- but that's not totally true. Husband Jim smoked 10 pounds of brisket Saturday so that the garden smelled heavenly. He did two racks of ribs on Sunday. Alas, neither of these meats made it's way to the prettily set tables! 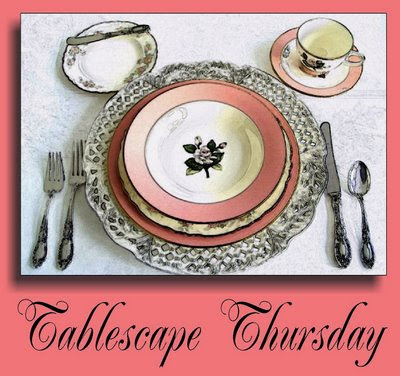 Please join Susan at Between Naps on the Porch to see what everyone else has done with their tables this week! The Garden Tour was a great success and here are some pictures of Linderhof's gardens -- at their best! "Jeeves" directing tour guests to go onto the front porch. Where our ticket takers sat under a cooling ceiling fan and sheltered from the sweltering sun. 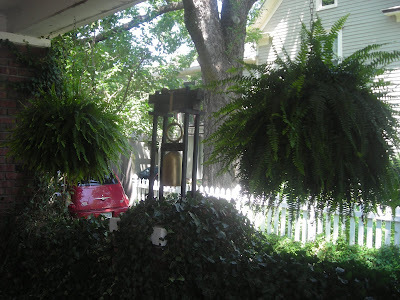 Under the portico past the ferns into the back garden. A few of my planters (I collect them!). The tall tree is a Dew Drop Tree -- one of the most asked about plants on the tour. 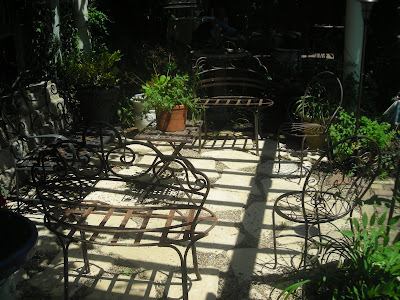 Before you enter the garden, a bistro table and chairs. It's a shady place in the morning. 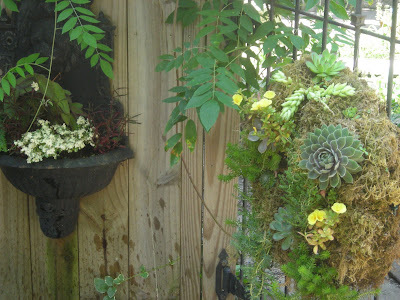 And through the garden gate . . . . so many people stopped to admire the succulent living wreath. 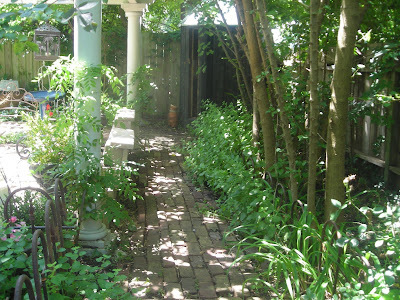 And into the garden -- with the fish pond on the right, the breakfast room straight ahead and the back garden and herb garden just a few feet away. From the potting shed, this is the view of the pergola. 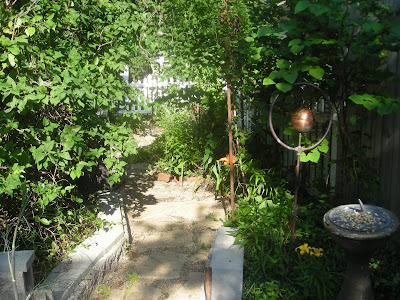 You go from patio through another arbor into the herb garden. From the pergola looking toward the breakfast room. 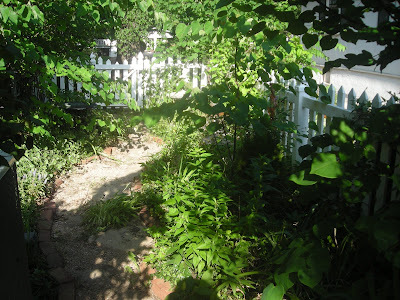 From the side garden looking toward the patio. 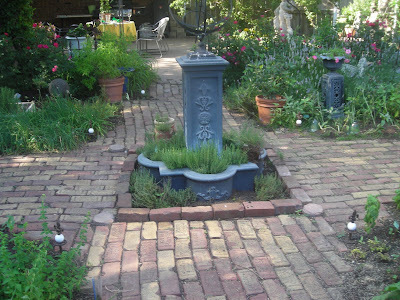 I wanted to share part of Linderhof's garden at Susan's Outdoor Wednesday. 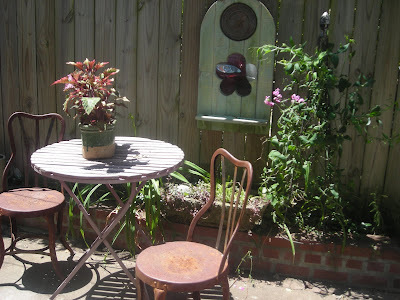 For more outdoor spots, visit Susan at A Southern Day Dreamer. It was fun being part of the tour and both Husband Jim and myself thoroughly enjoyed the weekend (although Saturday morning was a bit hectic). The gardens never looked better and I was happy to share them with the Tour Goers. 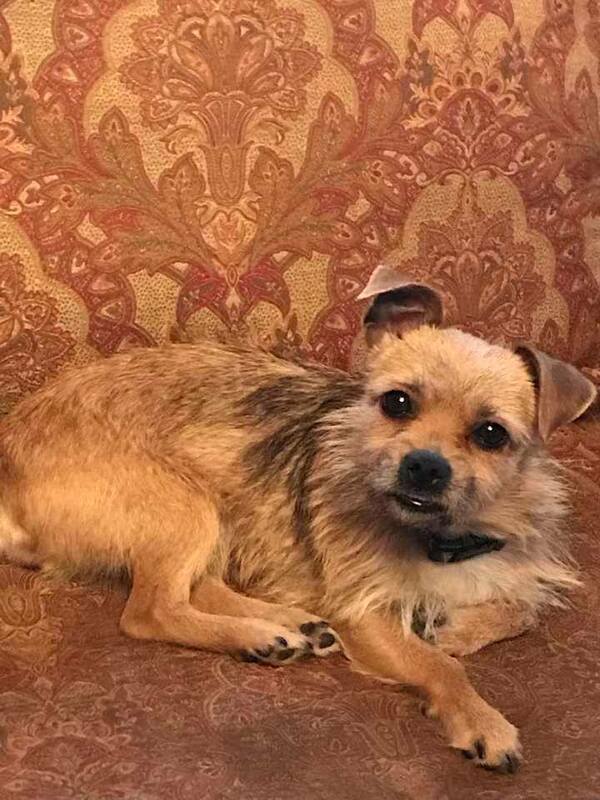 It's Three or More Tuesday hosted by The Gypsy's Corner. Stop by and see what everyone's threes are! My Threes are three fellow bloggers that I've been able to meet . . .
First and foremost is Mrs. Blandings. 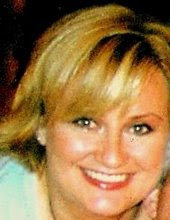 When and where I found her I'm not sure but adore her blog and she has been my mentor in my blogging adventures. 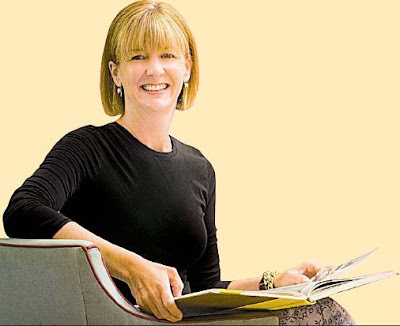 I got to meet her last October when we both were at Ina Garten's book signing. Alas, I had my camera and why I didn't get a picture of Patricia and I, I'm not sure. Not thinking, I would call it. 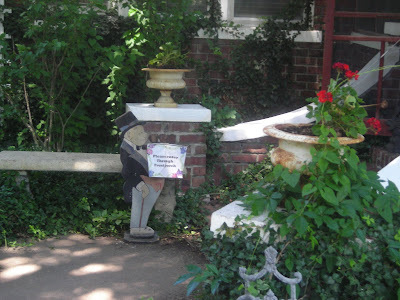 But I do have this photo of Mrs. Blandings -- it graced the front page of the Kansas City Star House and Home section yesterday. 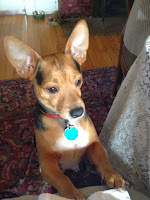 Because there was a blurb on page two about Patricia's article in Elle Decor. 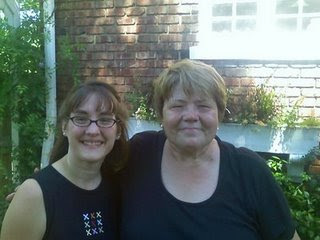 My second blog friend I got to meet last Saturday when Nancy from Acorn Cottage came to tour Linderhof's garden. A quick email before she left so I knew she was coming. And there she was in my garden! Even though it was the first time I had met her, we had emailed a lot as well and I am an avid fan of her blog. It didn't feel like I was meeting her for the first time but rather that we were old friends that hadn't gotten together in a while! It was a great time and I enjoyed taking her for a tour inside Linderhof! My camera -- up by the computer and although Nancy took lots of pictures, it seemed that I, once again, forgot to get a picture of us together. 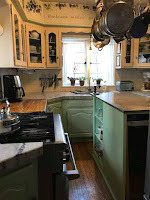 This picture is from her blog. And then on Sunday, out in the garden, a girl walked up to me, asked if I wrote Lines from Linderhof, and introduced herself as Carrie from The Art and Flair of Being Domestic. I was gobsmacked! She doesn't live 100 miles north as does Nancy and Mrs. Blandings. She lives far far away! And yet, here she was in my garden! I was a bit amazed! I took her and her family on a tour of Linderhof. Again, it was more meeting an old friend than a new friend. She didn't have her camera either but she had her phone and so she took a picture. It's nice to have a picture of Carrie in Linderhof's garden. Alas, my camera was still upstairs and once again I missed an opportunity for a photo with a fellow blogger. But Carrie had her phone and her kind husband took a picture . . . .
Of both Carrie and I! Although my third blogger friend whom I've met, this is the first picture of friends together!